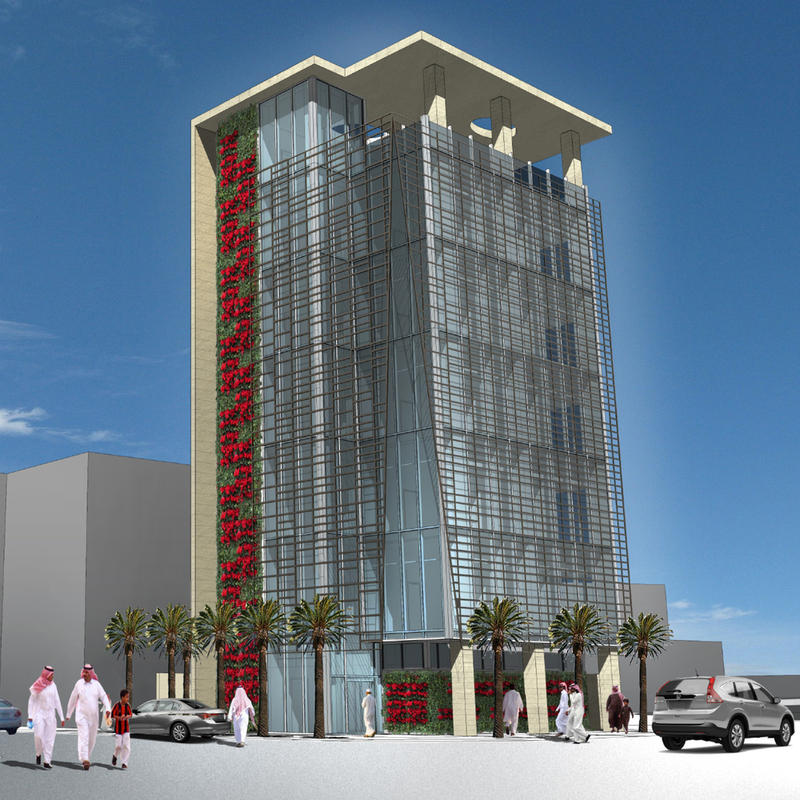 m ARCHITECTS served as the design architect for this six story office mid-rise in the urban core of Jeddah, Saudi Arabia. With the primary views being to the west overlooking a public garden and the Red Sea beyond, mitigating solar heat gain and glare was a priority. The solution was to wrap the primary facades of the building in a terra-cotta sunscreen, thus resembling the traditional arab mashrabiya screens found in the local vernacular architecture. The screen is then drawn back at the nortwest corner, both to signify the entrance and symbolically draw in the public garden caddy-corner from the site. A ‘solar-umbrella’ provides shade on the roof deck and helps to keep the desert sun off of the building envelope. Native plantings are incorporated into a green wall on the facades, a motif that is continued to the interior to blur the boundaries between indoors and out. The requirement to use an existing building footprint resulted in a tight first floor plate. By cantilevering the upper floors to the west, more usable space for the office floors was achieved while providing shade for the clerestory windows into the first floor common areas.